Sesame Street has always been a game-changing series that’s never shied away from addressing real issues like adversity and diversity, and nearly fifty years later, it’s not showing signs of stopping anytime soon. A few weeks ago, the highly popular children’s series announced its first autistic character, Julia, and she made her television debut just four days ago. This is such a critical move at a pivotal moment in our society because a 2014 survey conducted by the Centers for Disease Control reported that 1 out of 68 children are on the autism spectrum, and as that number increases, we need to learn more about autism and how to respectfully engage with and include children with autism instead of excluding them as some may already do. 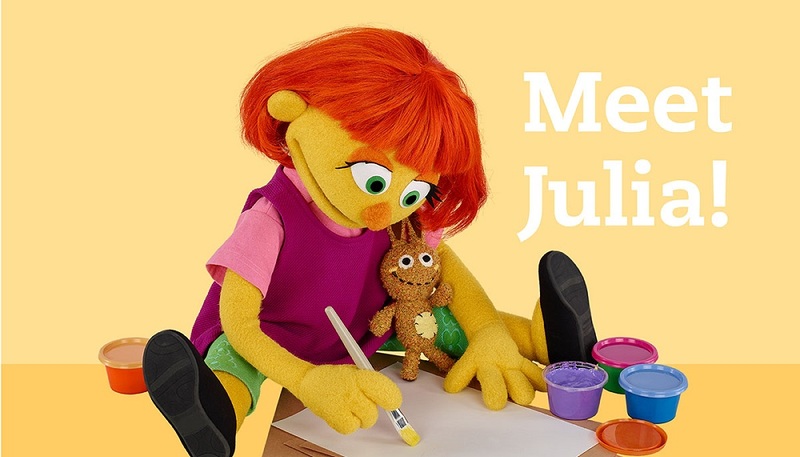 While autism impacts everyone in different ways, Julia’s character is a great addition that will show children with autism that they, too, matter and are worthy to be seen and celebrated! In case you missed the premiere, check out the first episode below. Okay, grab your tissues for this one! I’m not a devoted Dancing With the Stars fan, but this week’s episode really tugged at my heartstrings. This week focused on each dancer’s most memorable year and dance routines were choreographed to reflect the feelings and experiences that were recounted. Former Glee star Heather Morris remembered her wedding day and Chicago Cubbie David Ross remembered the Cubs first win in 100+ years, but my favorite performance of the evening was from Olympic gymnast Simone Biles who remembered her adoption. The music, the dance, and her story are all sure to have you crying like a baby. Lucky for you, this is a judgment-free zone. Calling all New York residents: FREE TUITION!!! Just when you thought New York couldn’t get any better, it does by being the first state to pass legislation that makes four-year public university tuition free to full-time residential students whose families earn $100,000 or less! This is such an incredible opportunity for students and families to obtain a college degree without the stress and concern over finances, which oftentimes becomes a primary reason as to why students don’t stay in school and graduate. My hope is that other states follow New York’s outstanding move. This is the type of leadership we need! I LOVE avocado! The more of this healthy fat, the better, which is why I can’t believe Brooklyn is the first place to recognize how awesome avocados are and see that they are worthy of their own shop. Avocaderia is the world’s first avocado-only restaurant, and it just opened earlier this month with the intent to serve toast, salads, bowls, and smoothies galore with avocado at its core, of course. Hold on, currently purchasing a round trip ticket to NYC (not on United, though). If you’re already in the area, definitely head on over and tell us if it’s worth the hype. For now, I’ll just stop by my local grocery store and continue adding avocados to just about everything. Did you discover something this week that you’d like to share with the Kermit Says… family? We’d love to hear from you so please comment below!